It's been awhile since I've posted anything, and Will Baird asked me if I'd gotten a job yet, so I realized that few of you out there in readerland might know if I'm back on my feet or not. So this post will be a general update post on things that have going on in Zach World. 1. I got a job: I'm back to my legal assistant roots, this time at a trust and estate firm. This is a whole new skill set, and virtually none of my previous experience (contract law, risk management, etc.) carries over to here. My employer says it takes about a year for new people before the whole thing "clicks," and I believe it. I thought I'd be taking a significant pay cut, but I got my W-2 from my previous job and found out that--hey, look--they chopped my pay by about 8K without telling me. So that was great. So it's not the pay cut I thought it was! I really enjoy the people, and I have my own office and parking space. Unfortunately, I am really tied to an 8-hour day, and that wasn't the case at my previous two jobs. But I've been there for about a week and a half now, and I like it. 2. Gecko Death Watch: I'm down to one lizard (Solid) and she's obvious got some kind of infection. It started about two or three weeks ago. She's not eating, but bizarrely, she's just as active and is otherwise acting completely normal. Aside from the loss of appetite, I know she's sick because she's pooping out white blobs of...gross. And it requires effort to do so--I've watched her push one out, and it looks taxing. I took her to the vet, they did some Xrays to see if she had impacted eggs, but she didn't, so they gave her an enema and some antibiotics. I think she needs another enema, and it's clear that didn't solve the problem. Unfortunately, it's not really worth the cost to take her back there ($220? The lizard cost $20!) so if the problem doesn't go away on its own and she starts spiraling, I'll be down to NO lizards. It's so strange that all of my geckos have become infected with different things in this last year. 3. Dark Void Zero:This is the first DSiWare game I've bought voluntarily. It's really, really good, and from what I've read, better than the PS3/360 game. 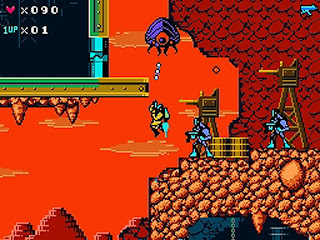 This is hilarious because Dark Void Zero is essentially an 8-bit NES game with chiptunes that was developed at Capcom as a joke while the main team was working on the PS3/360 game. It's fantastic, and brings to mind games like Bionic Commando, but replace the bionic arm with a bitchin' jetpack. It's very short, but it's also only $5, and there are three difficulties to conquer. If you have a DSi, I can't recommend this highly enough. So far, it's DSiWare's one killer app. 4. Spider-Man: Reign: You can also call this The Web-Slinger Returns, as it's essentially a Spider-Man version of The Dark Knight Returns. Even the art style is similar. It's not as long or fleshed out, but it's still fun. I got it at Barnes & Nobel on sale for like $6, which is about right. There's a lot of sobbing over MJ's death, and Doc Oc's appearance isn't explained very well, but it's an interesting departure from the usual Spider-Man silliness. I would really like to see one of these "far in the future" superhero books illustrated by somebody whose art I like, though. 5. I still haven't seen Avatar: I didn't have a job for awhile, so money was tight. I'm not real interested in blowing like $16 on the 3D version, but everybody tells me that's the way to see it, so...yeah. Just to be clear: I don't give two craps about the storyline or even the blue cat people, I'm only in this for the xenobiology and plant life. I will see it in theaters, and I will enjoy it, but it's taken much longer than I thought it would. 6. Paleontology is Awesome: I know I've been remiss in posting about two very awesome stories, and it might be awhile until I really get around to it, so I urge you to read David Hone's rundown of the new basal alvarezsauroid, Haplocheirus sollers. I've been working on draft drawing. Someday I'll post it here. 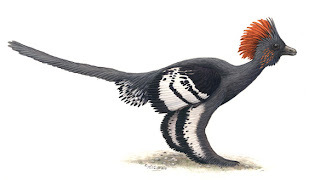 For the other big news, Ed Yong has you covered as to the colorful story about Anchiornis. I've encouraged Scott and Raven to join me in producing a trio of Anchiornis drawings to show off the colors. 7. Tatsunoko vs. Capcom is Also Awesome: If you liked Smash Bros., this is the next-best thing. Leave your friend code in the comments. We'll rock it. My friend code is 3867-9477-7677. I am an expert with Morrigan and Frank West. I haven't messed with the Tatsunoko characters much, but that's because I'm trying to unlock Zero first. My strategy with fighting games has generally been this: Favor the female character with the largest breasts or most revealing outfit, then practice enough to get very, very skilled with her. Thus, I am deadly with Ivy in Soul Calibur IV. Well, probably not anymore, because I haven't touched that game in like six months. I also got Excitebots for a song. It's a great online game. If you have it, leave your friend code and add me: 2837-1198-4749. And for you PS3 fans, my PSN name is Sillysaur and I play a lot of Little Big Planet and Modern Warfare 2.
hooray new job! here's hopin' your lizard is fine. also, screw 3D, see Avatar in regular vision first, so that you can actually catch little nuances and won't be distracted by "oh look at that!" which will happen anyway.